Surrounded by hills, Bologna’s city center still appears much as it did during the Renaissance – rust-colored buildings, wide piazzas, majestic churches and covered walkways with floors laid with marble. Viewing its amazing architecture or standing under some arcade, you’ll get the feeling that you’ve found yourself in the middle ages. And this impression is only augmented if you visit some of the local museums or galleries. – It’s a very characteristic place – when you enter you have the impression of being inside a sailboat (“veliero” means sailboat). – Former factory converted into “the factory of fun” – the setting is inspired by Dante’s La Divina Commedia. Piazza Santo Stefano – s “Kostelem sedm kostelů” a renesančními budovami. The typical local “osterie” in the city center where you can stop to eat something while walking without any specific destination. The St. Luca Church on the hills and the endless stairs to reach it! The church of St. Petronio with its facade still unfinished after centuries, and the former Jewish “ghetto”. To master the secrets of Bologna you have to walk along its narrow streets and discover the old renaissance palaces (in Strada Maggiore, via S. Stefano, via Barberie), which hide wonderful inner gardens behind their gates. The best way to enjoy Bologna is browsing the fashionable pubs and bars in the city center. Don’t miss the traditional “aperitivo” in one of the lounge cafés in via dei Musei and, of course, sipping a typical espresso at Zanarini. Ascending the leaning tower Torre Asinelli, strolling in the center, including a visit of the morning market in Via delle Clavature street. In the park Giardini Margherita you can see Romano Prodi, former President of the EU commission, jogging. Don’t stroll alone in the evening. In certain quarters, Bologna is as dangerous as the suburbs of Rio de Janeiro. 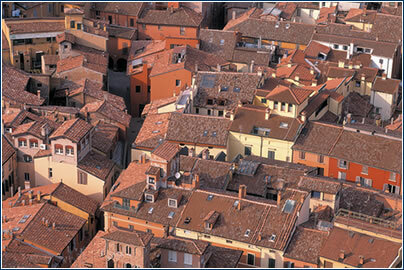 www.bolognaturismo.info – the Bologna turismo office provides services for visitors. www.hellobologna.bolognafiere.it/eng – How to best enjoy your trip to Bologna. www.deliciousitaly.com/EmiliaRomagnatapt.htm – the official web site of the Emilia Romagna region. 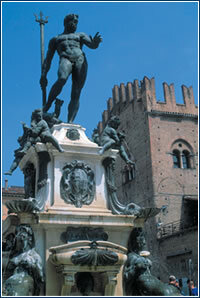 www.bologna.world-guides.com – well-known guide offering advice on where to eat in Bologna, accommodation and transport. · Don’t miss the views of Bologna from the heights of the neighboring hills. From the San Mamolo Gate, head on foot or by car to places where the locals get away from the city bustle on weekends. This outing is worth the effort especially in the spring and autumn. · A favorite gathering spot is Fontana di Nettuno (Neptune’s Fountain), between Piazza del Nettuno and Piazza Maggiore. It was built in 1566 by Tomaso Laureti, and later Giambologna decorated it. · You definitely should visit local restaurants and try some of the native specialties. Lasagna and tortellini originated here, and a glass of good red wine goes perfectly with them. · Bologna is the main city of the Emilia Romagna region in Italy, and all the major transport arteries linking northern and southern Italy intersect here. Industry flourishes (chemicals, auto, steel, and food processing), as does agriculture. · 900 years ago, the oldest university in all of Europe was founded here, and today it attracts students from around the world – so the city’s streets are enlivened by many young people enjoying themselves in a variety of ways. 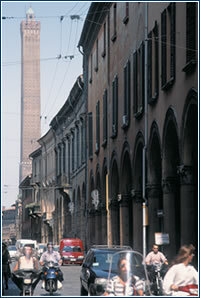 · Bologna’s towers are dominated by the leaning Asinelli on Piazza di Porta Ravegnana. In the 12th century the Asinelli family erected this 97 meter structure. If you want to delight in a view of the city from its height and (weather permitting) the Adriatic Sea, first you’ll have to climb its 500 steps.